During the First World War, German doctors did their best to treat the thousands of soldiers broken mentally, rather than physically, by the horrors in which they were obliged to live, fight and die. The Nazis showed no such mercy to either soldiers or civilians. Hitler was a fervent proponent of the death penalty. Goering insisting that killings were carried by axe rather than the guillotine. During the Weimar Republic (1919 to 1932), 1,141 prisoners were sentenced to death. Only 184 were executed. In the years of Depression, between 1929 and 1933, fewer than 10 % of death sentences were carried out. That despite public concerns of a crime wave. Once the National Socialists came to power, however, both death sentences and the percentage of executions increased sharply. Between 1933 and 1939 over 80 % were executed. The Volksgerichtshof (People’s Court) was set-up in 1934, on the personal order of Hitler. He had been angered by the outcome of the Reichstag fire trial at which all but one of the defendants was acquitted. Freisler acted as both judge and prosecutor. He abused, vilified, denounced and sentenced defendants without any objections from defence counsel. Knowing what was good for them, they usually remained silent throughout. 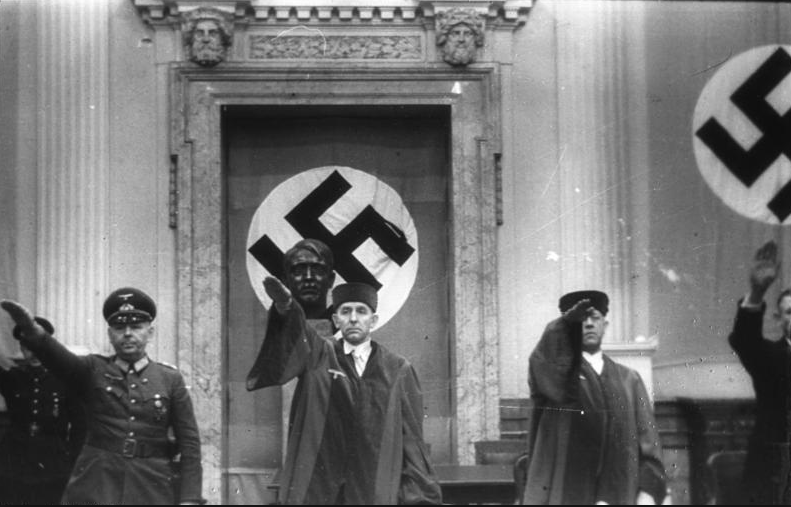 Judge-President Roland Freisler (centre) who ran a ‘kangaroo court’ Special Court on behalf of the Nazis. He is believed to have been killed by an Allied air-raid towards the end of the war. Among those Roland Freisler condemned to death in less than an hour, were young students belonging to the White Rose resistance movement. I will tell their tragic story in a future blog. When the war started only three offences were punishable by death. By its end, there were some 46. Death penalties passed by civilian courts in 1939 amounted to 36. Five years later they had risen to 2,097 out of a total of 4,379 sentenced. These figures do not take into account the scores murdered without trial on order of Hitler, Himmler or the Police. During the war the number of military trials rose from 12,853 in December 1939 to 44,955 in October 1944. Death sentences increased from 519, between 1939 and 1940, to 4,118 between 1943 and 1944. Military courts were even more brutal than the civilian ones. Over the same period they sentenced between 13,000 and 15,000 men to death. Around 85 % of the sentences were carried out. Even when the war was coming to an end and defeat certain, this murderous tyrant continued. Their masters, needless to say, also ‘funked a hero’s death’ whenever possible. They chose suicide rather than facing the enemy in the streets as they urged their followers to do – on pain of execution. 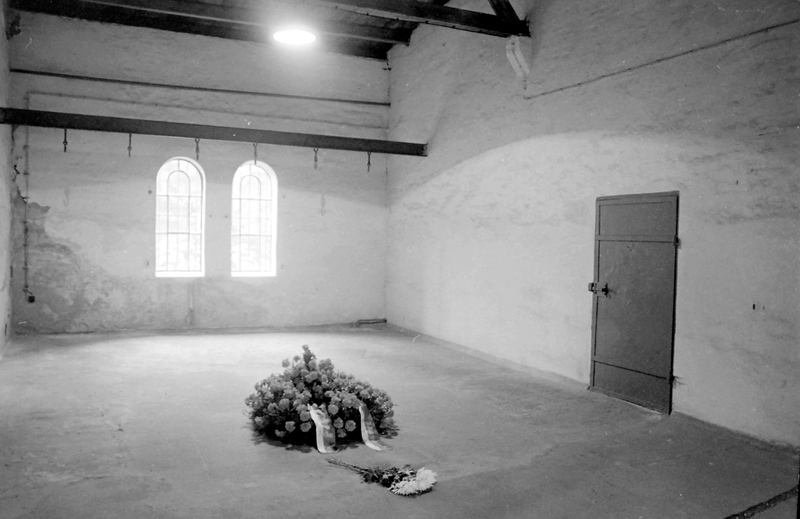 The Berlin prison execution chamber where up to six condemned men were hanged from piano wire nooses. and bloggers made just right content material as you probably did, the web shall be much more useful than ever before. Thank you so much. Sorry you lost your comment, it happened to everyone I think it certainly has to me and there is nothing more aggravating. Glad it worked out well for you, enjoy your dinner! Great to read your comment about liking my post for which I most appreciative. I try and post a new blog every weekend, when I’m not working at the University. If the subject interests you it might be worthwhile glancing at the site every Monday. For my next blog I will be talking about how Hitler really sounded in his private life with some unique audio recordings. Hope you enjoy this as well. Hi, thanks for your interesting comment. I am not hugely familiar with this subject but will ask my IT specialist to comment on the subject you raise and get back you as soon as possible. Thank you so much for your comment which was very nice to receive and much appreciated. Many thanks for your kind comment, I’m so pleased you like the blog. I hope I can keep up standards you expect I will certainly endeavour to do so. How very kind of you to take the time and trouble to post this kind comment which is greatly appreciated. There are some very good history websites. I will track down a few of the best and get back to you with a list in the next few days. Many thanks for taking the time and trouble to post your comment which is greatly appreciated. Thank you so much for your helpful comments. I will dp my best to track down some relevant and interesting video clips and photographs. My problem is that, despite spending long hours in the Federal Archives, finding original material which is not going to cost me a fortune in copyright fees is tricky. Nonetheless I will do my best and thank you for the helpful suggestion. I’m delighted that you find my blogs of interest and most grateful to you for taking the time to post.